Dafuq are the anti-lag videos? DE80q wrote: Oh, I'm also in contract to buy a house, with closing set for the 16th! It will be strange to have a garage of my own to work in! Jared isn't allowed to say 10v... I always know when he posts! Well today I had a car show up in my new garage... An 87 80q... What should I do with it? Nice!! Body and paint look to be in good shape. 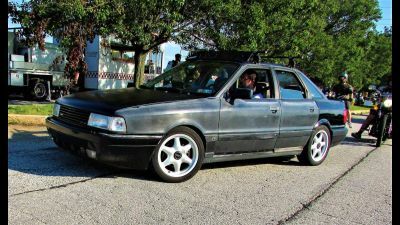 Since I already have a hot rod in the Cq, I intend to make my 80q into a winter beater/commuter car that will challenge and surprise some modern sports cars. For less than $5k, total. With the amount of spare parts I've accumulated over the years (AANs, 01Es, etc) it shouldn't be too difficult to pull off! Finding the time will be the biggest challenge, lol. PRY4SNO wrote: Nice!! Body and paint look to be in good shape. The funny part is, I bought it off a friend, so it has a bunch of my old parts on it... Exhaust, shifter, clear corners, and some others... I got it plenty cheap, so keep or part out is what I need to decide. Oh, it has new tires and H&R springs too haha. Keep it for now, rob some parts for the Bandit as you want/need and deal with it later when the right proposition materializes. 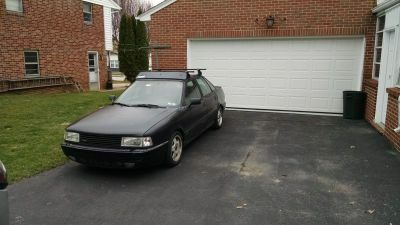 I'm seriously considering making a rally inspired lifted sedan. Would be a huge switch from the bandit which pretty much sits on the ground. The desicion has been made to part out the "new" 80q. I was told it has H&R springs and 2 piece suspension. I also know it has clear corners and my old(came from George's 80q) stebro rear mufer. I'll post up a part out thread soon. Just way to many things have been hacked for me to attempt to save it. The bandit has found it's new home! Only issue I had getting it there was when I stopped for gas. When I started it back up, the ISV decided it didn't want to work correcty... This has been a common issue for me though. Still need to figure it out. With carlsile fast approaching I figured it was time to get the bandit ready. First I swapped the snows out for the summer wheels, then put it up to check out under the car. 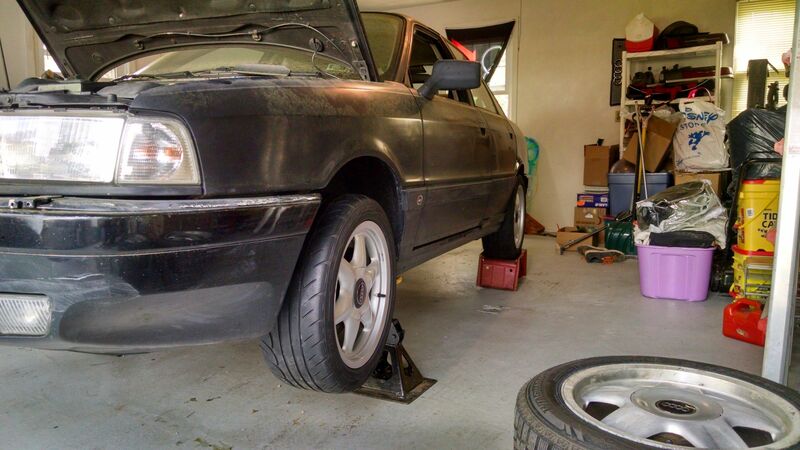 Only had one pair of stands here at the new house, so dad old school wheel stands got put to work! 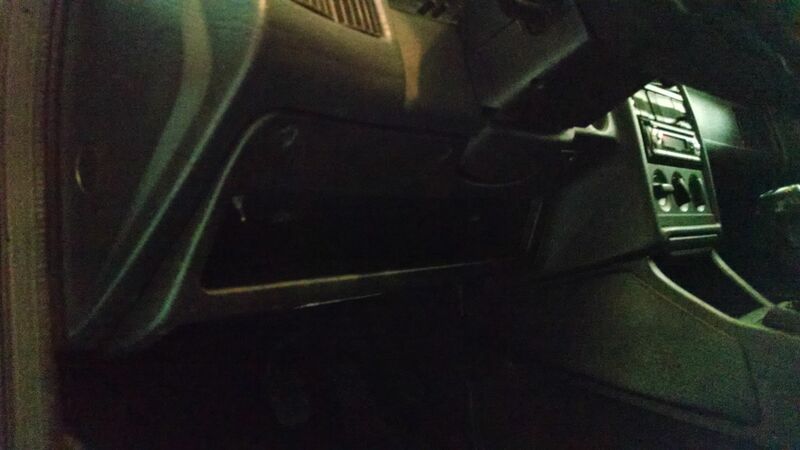 Looking at the parts car, it has a DS knee cubby, so I decided to put it in, I was pretty surprised about having to remove the brackets for the later style to be able to fit it in... Kind of a PITA with the dash installed, but I got them out. The cubby already had a switch drilled into it from the he previous ower's mood lighting, so I decided it would be a good switch for the launch control activation! 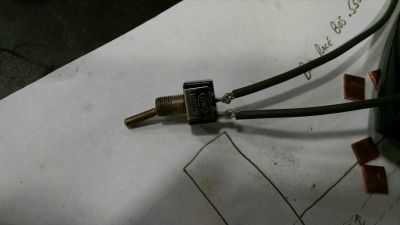 When I pulled back the insulation, the wires that had been soldered to the switch had broken off, so I took it to work and soldered on some 20g wire. After fighting with the wiring I had tucked away, I was able to get the cubby bolted in. I'll have to pull it out later and reorganize the wiring, but this will work for now. Yesterday I figured it out and fixed it. Turns out the damn nut had backed off on the strut housing allowing the strut to move! I used a massive pair of channel locks, and turned it nearly 2 full turns! Now I can drive this thing without worrying about the RF wheel falling off! Yay! Man, sometimes it's the crazy little things. Nice that you found it, and thanks for posting. Now I have that as something to look out for on the back burner. I really thought I had a ball joint about to come apart or something of that nature. It was just hard to pin point what was actually making the noise, because it only happened when I would hit a harsh bump like a pot hole. One thing I didn't know, was they were taking pics of every car as they entered... So attached is the one they too of mine. Could be worse all things considered. I did it again... I have another turbo on the way. This time I will be putting it in! Anyways, it was listed as a Porsche upgrade, but the seller wasn't interested in giving any details. The only thing in the description was "excellent condition". It has obviously been heats cycled many times, as the turbine houseing appears "peeled". That's ok though, I'll get it cleaned up and checked out. I can't find much in the brand though, ITS comes up as a turbo rebuilder in the UK. Anyone have any idea? I'm thinking To4 based. Thanks, the filter they used was very flattering haha. As for the mystery turbo, I'll have to spec it out, and figure out what turbo it is when it gets here on Monday. I figure I'm ringing out this K24 to 20psi+, so need something different to go more. I decided to take some comparison pics of a K26 Vs the new turbo. The exhaust housing is an Audi K26 #6 housing, and I think the compressor housing is from a Porsche K26/6. Well, I can finally let this one out the bag. About a month ago, I had a lengthy discussion with Tim about making a higher flowing, factory placement manifold. Over the past couple weeks, I've been getting some pretty neat pictures of his progress. It almost done now, just one last tube to make for the wastegate. Figure at this point, I can start sharing some of these pics. Tell me what you guys think. I think that looks fantastic. A real nice and tidy package. Also curious as to where you got the wastegate flange or if it was made. I can't find one state side for the manifold I'm building. Tim made some 304ss ones for the manifolds he was making.